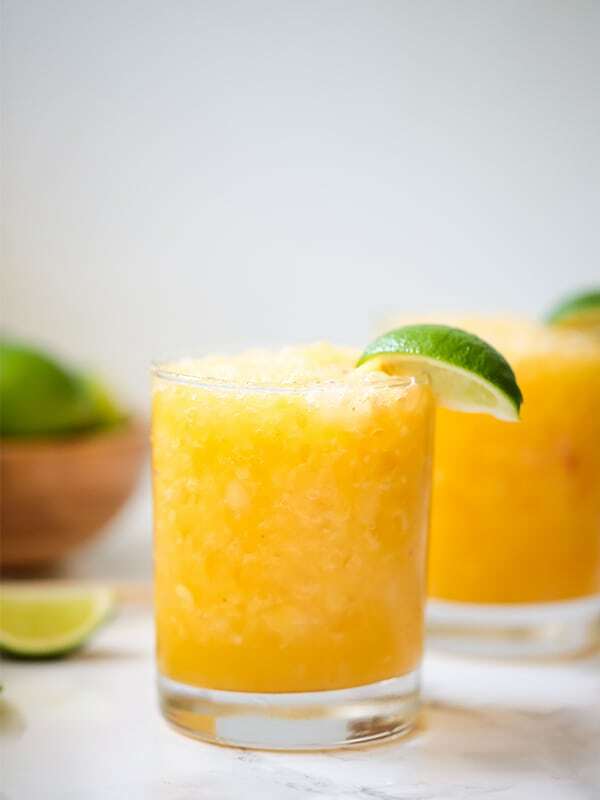 This frozen mango margarita mocktail is the perfect drink to enjoy on Cinco De Mayo, or a fun evening! It’s both paleo and AIP. Margaritas are serious business this time of year, and this margarita cocktail is the real deal! I frequently get asked if I’ve reintroduced alcohol after healing from Hashimoto’s. My answer, is that I was never really a drinker before I went on a healing diet, nor am I now. It’s just never been my thing. However, I love a delicious beverage regardless! Margaritas are one of those drinks that have always peaked my interest. Not just because my birthday is on Cinco De Mayo, but because everyone loves them and they look darn good. 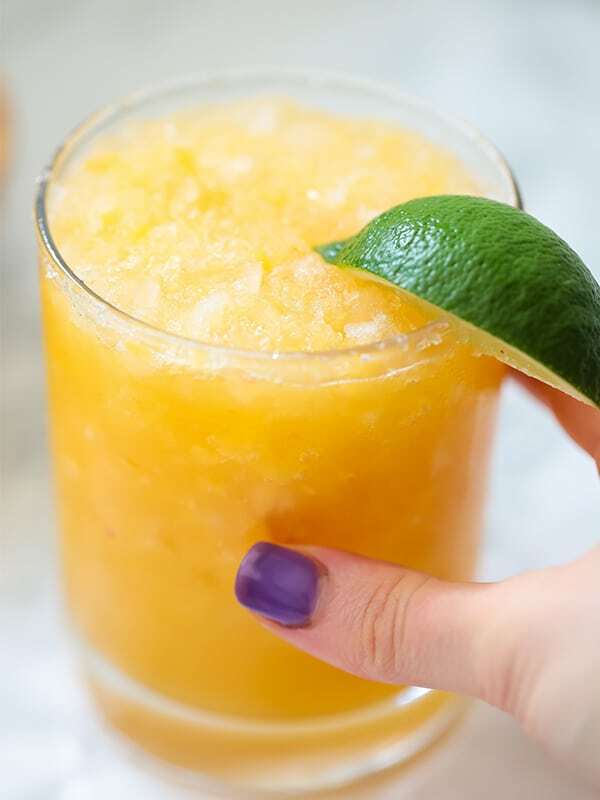 This frozen mango margarita mocktail is the perfect drink to sip on Cinco De Mayo, or really any day to feel like you’ve got a fun cocktail without the alcohol! This is the base of the mocktail. There are lots of good quality orange juices out there, or you can make your own at home. You only need 1/4 cup of lime juice, so you can either make this at home, or buy a good quality lime juice from the store. 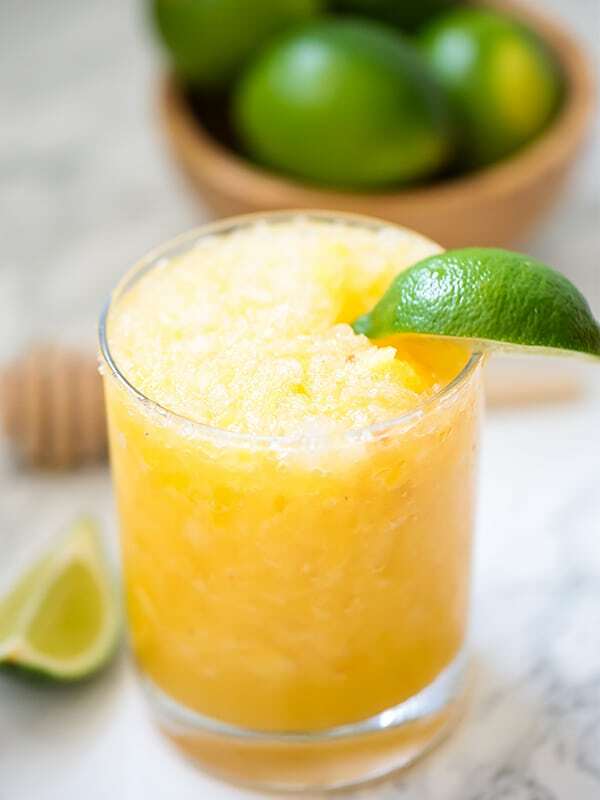 The drink is already fairly sweet with the honey, but the honey cuts through the sourness of the lime and adds more of that traditional margarita flavor. This adds amazing flavor and thickens the drink more. You can experiment with different fruit here with something like peaches, or even strawberries. Obviously this is a mocktail, but if you can and want to have a shot of tequila in there, it will totally work! Patron Silver is actually made from agave and is a grain free alcohol, so it can be a safer choice if you’re looking to transition into trying some alcohol. Prepare two glasses and slide a lime slide across the rim of the glasses. Dip the rim into sea salt to coat the rim. Set aside. Using a high-speedd blender, blend the orange juice, lime juice, honey and frozen mango. Blend for 15-20 seconds until a thick liquid. Add the crushed ice and blend for 10 seconds to combine. Pour the margarita mix into the glasses and serve with lime slices.